I've been doing some reviewing for Master Books lately, and I have to admit I wasn't really all that interested in the latest option for review. 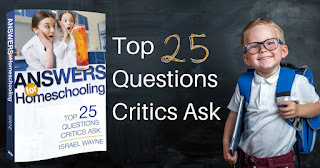 Answers for Homeschooling: Top 25 Questions Critics Ask by Israel Wayne sounds like it could be a great book, but I've been at this homeschooling gig for quite a long time now. I didn't think this was something that I really needed. And then I ended up spending the weekend in the hospital with my 19-year-old. He spent a lot of that time sleeping. At some point, I realized that I had put this ebook into Dropbox and I could access it on my iPad. That meant I did have something to read. And something that was relatively easy to read in the constant-interruptions atmosphere of a hospital room. I've read a lot about homeschooling over the past two decades. 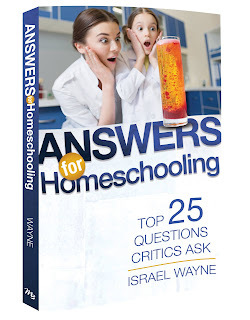 And part of me was definitely asking, "WHY do we need yet another book about homeschooling?" I was amused to see that question addressed in the introduction, especially as I found myself agreeing with the answer. So many of the people putting themselves forward as experts in homeschooling have not been at it all that long, and they just don't have the first-hand history. I find myself being pretty cynical with anyone telling me they have the answers when they started homeschooling two years ago and their oldest child is 10. 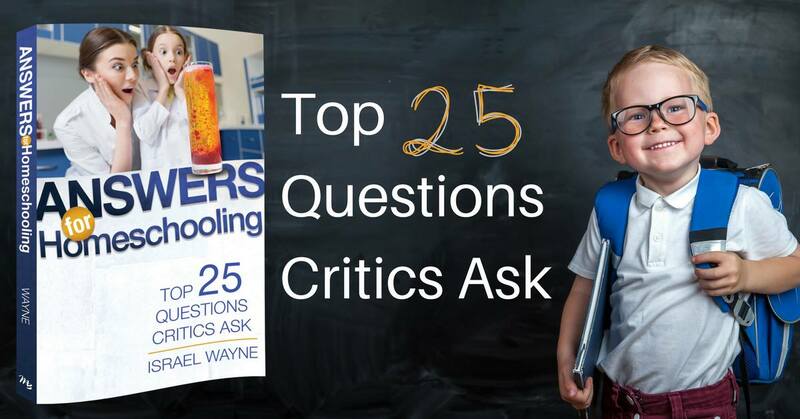 I cannot level that criticism at Israel Wayne. He was homeschooled himself, and I believe he wrote that his oldest is 17 now, and he and his wife have homeschooled all along. That means while I do have two or maybe three children older than his (who I have homeschooled all along), he is pretty close. And he was homeschooled, so he can see the student side in a way I can't. Now, I'm not saying I had any real aha moments with this book, but I did find it encouraging. There are some homeschooling issues I've struggled with lately, and it almost felt like he had listened to my arguments in my head and wrote them out far more concisely than I've managed to do. Chapter 11: What If I Don’t Have Enough Patience? was one I particularly loved. Every time someone tells me that they don't have enough patience to homeschool, I find myself mentally screaming, "Homeschooling GAVE me patience!" His answer was similar. Minus the screaming part. I think this book is great for those who are pretty new to homeschooling, in need of a veteran's perspective. I think this book is also very good for those of us who have been at this for a long time. Disclaimer: I received this ebook for free from Master Books. No other compensation was received. The fact that I received complimentary products does not guarantee a favorable review.